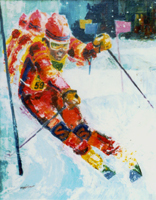 What Franz Klammer did on the downhill run of Patscherkofel on February 5, on the first day of serious competition, can hardly be overstated. No sooner did he complete his daredevil, on-the-edge-of-disaster, one minute and forty-five second dash down Patscherkofel than it took its place among the most defining moments of the Olympic Games. 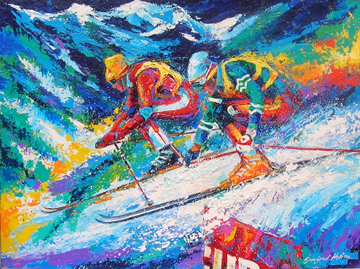 An original painting, commissioned by a private collector. 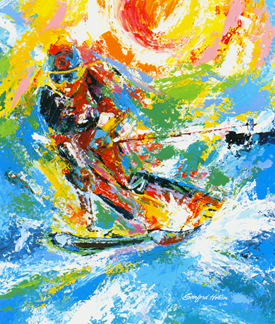 This artwork is available as an enhanced giclee. Contact us. 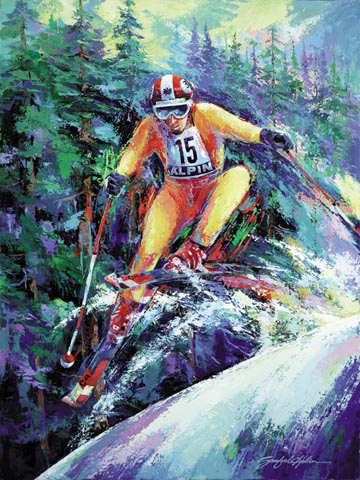 The artist has produced this canvas art using the gicleé process. Each one of these exclusive multi-media works have been masterfully hand embellished in acrylic paint by Sanford Holien and individually numbered and signed in paint. 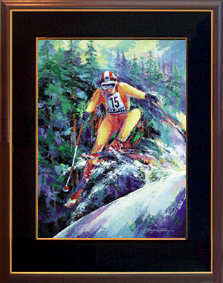 The canvas is mounted in a deluxe multi-profile frame with fabric liner.